Quick and easy to make, just add milk. No artificial colours or flavours. Suitable for vegetarians. All you need is... 568ml (1 pint) milk* *reconstituted milk is not recommended 10 Prep' time 1-4 hours To Set To Make the Filling... 1 Heat the milk in a large saucepan to almost boiling point and remove from the heat. 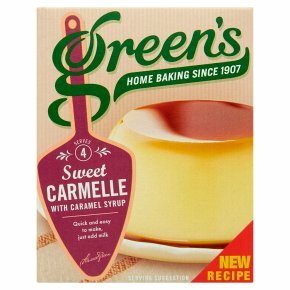 Sprinkle the Carmelle mix over the surface and bring to the boil for two minutes, stirring continuously. 2 Empty the caramel syrup into 4 small ramekins or... alternatively you can make one large dessert by using a 1 pint mould. Pour the Carmelle liquid on top of the caramel syrup. Allow to cool at room temperature. 3 Refrigerate for 1 hour for small ramekins and 2-4 hour for one large bowl. Turn out onto a plate (this can be served up to 24 hours later if refrigerated).